A super easy, healthy chicken salad recipe that is packed with flavor! Chicken Feta Walnut Grape Chopped Salad topped with a homemade Balsamic Vinaigrette. 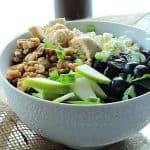 In a large salad bowl, add spinach, walnuts, grapes, chicken, and feta cheese.